For reporting purposes sometimes its elegant to show dates as quarters of the year instead of months. It helps managing clutter in a large set of data. As much as I wish there was a way to do it using custom number formatting Excel doesn’t have such ability as such and thus we have to look somewhere else. Formatting Dates as Quarters – Thoughts! I personally like the use of TEXT function to format year part of the format as it gives me much more flexibility then using using simple YEAR function. “&” connector: short-hand application of CONCATENATE function and is helping make a text string by connecting the output from several functions and manual input of “Q” at the start. TEXT: this function help us not only fetch the year portion of the date but also format the way we want. 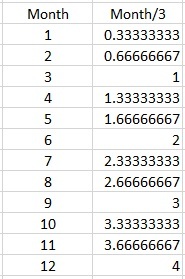 You can see in second type I used “YY” that rendered us only last two digits of the respective year number. And if “YYYY” is used it helped us get the full year number. And again all this is connected together using “&” connector to give us one text string. Next articleWorking on Multiple Excel Worksheets – 3 Tricks to know! What would be a formula if April, May, June were the first quarters?? For that you can either do with or without helper column. 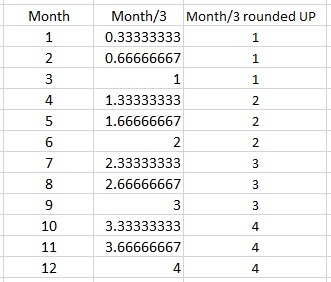 First you will have to adjust the month numbers to go according to custom fiscal year and then divide the month numbers by 3 to get the correct quarter numbers.